If you visit WordPress.org regularly you might have noticed some changes around the place. If you don’t, now’s the time to check them out! We’ve been working hard to improve the site to make it more useful to everyone, both developers and users, and we hope you like what we’ve done. 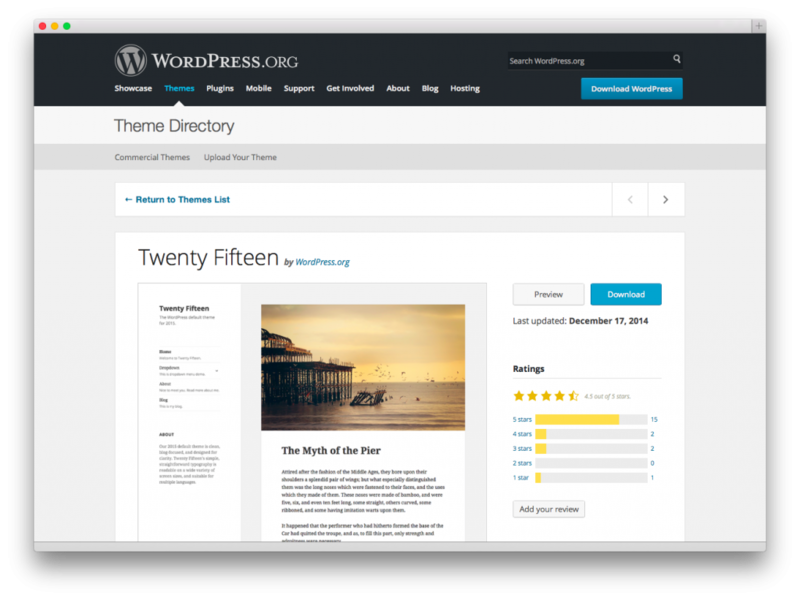 Since WordPress 3.8, you’ve been enjoying improved theme management in your WordPress admin, and in WordPress 4.0 plugin management was refined. We’ve brought these experiences from your admin and re-created them right here on WordPress.org. The Theme Directory has a better browsing experience, with handy tabs where you can view featured, popular, and the latest themes. As with the theme experience in your admin, you can use the feature filter to browse for just the right theme for your WordPress website. Click on a theme to get more information about it, including shiny screenshots, ratings, and statistics. Konstantin Obenland posted a good overview of everything involved with the theme directory overhaul and followed up with a post on improved statistics. 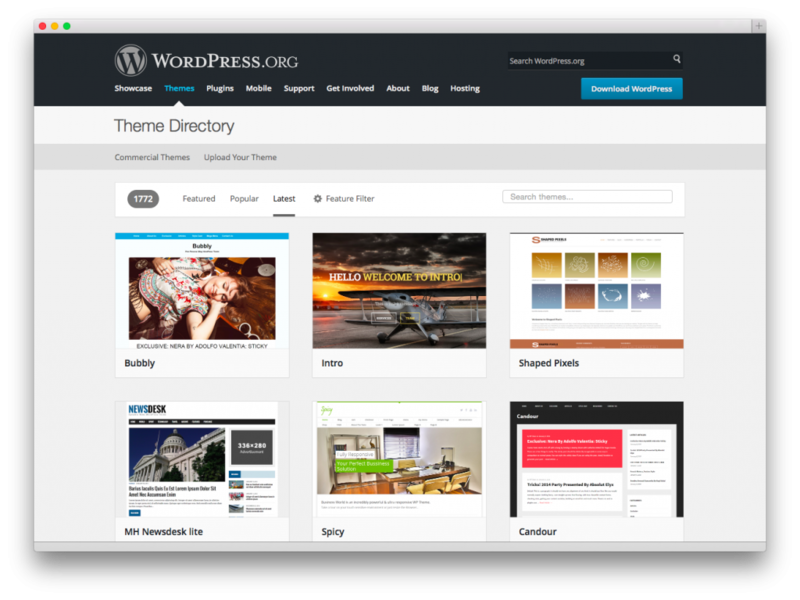 The Plugin Directory has a brand new theme that mirrors the experience in your WordPress admin, with a more visual experience, and better search and statistics. Favorites – when you’re logged in to you WordPress.org account, this page gives you direct access to the plugins that you have favorited. Beta Testing – try out plugins where developers are experimenting with new features for WordPress. Search by plugin author – you can search for a plugin author using their username. Better statistics – listings now display the number of active installs so you can see how many people are actually using a plugin. An overview of the new theme was posted by Scott Reilly. We’ve made huge improvements to our statistics. This gives us more useful information about the WordPress versions people are using, their PHP version, and their MySQL version. Already these new statistics have provided us with useful insights into WordPress usage. More than 43% of all sites are running the latest version of WordPress. Previously, we thought only 10% of sites were up-to-date. By excluding sites that are no longer online we were able to improve these statistics. We were able to clear up the data around WordPress 3.0, bringing it more in line with expectations. This anomaly was a by-product of spammers. Only 15.9% of sites are using PHP 5.2, which is better than we thought. Over the coming months we’ll be able to use these statistics to bring you new tools and improvements, and to make more informed decisions across the board. Read Andrew Nacin’s post about these changes for more background. Thanks to everyone who contributed to the theme directory redesign, the plugin directory refresh, and improved statistics: Alin Marcu, Damon Cook, Dion Hulse, Dominik Schilling, Jan Cavan Boulas, Konstantin Obenland, Kyle Maurer, Matías Ventura, Mel Choyce, Natalie MacLees, Paul de Wouters, Samuel Sidler, Samuel Wood (Otto), Scott Reilly, Siobhan McKeown. If you want to help out or follow along with future WordPress.org projects, check out Make WordPress and our meta development blog.